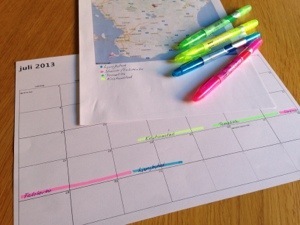 In 4 weeks our vacation starts and I’m right now in planning mode. Accommodation is booked as of 1,5 month ago and I’ve started to research things to see in the different areas of Skåne (the southern province of Sweden) we will be visiting. Everything is color coded both on the calendar and the map. All I need to finalize is which castles we should visit (there is plenty of them in Skåne!). I’m planning to see at least 2-3 in each of the areas. Yes, I love castles! 🙂 I also want to research what geocaches suits our schedule.